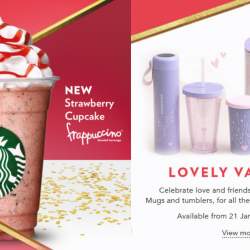 From 21 Jan 2019 Starbucks: NEW Strawberry Cupcake Frappuccino® & Valentine’s Day Collection Available for A Limited Time! It’s pink, it’s pretty and it’s oh-so-tasty. Meet the new Starbucks Strawberry Cupcake Frappuccino® blended beverage. Grab a Venti-sized Strawberry Cupcake Frappuccino® blended beverage from 21 January 2019 and receive a Starbucks Heart Card (with $0 value). Designs may vary, available while stocks last. 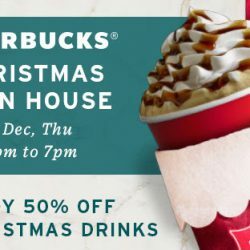 5pm to 7pm Starbucks: Christmas Open House at All Stores on 6 Dec – 50% OFF All Christmas Drinks! Giving good starts with you. 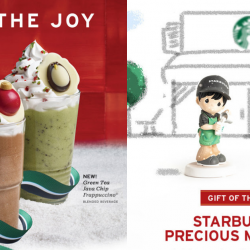 Join the yearly Starbucks Christmas Open House on 6 Dec, 5-7pm to enjoy 50% off all Christmas drinks. 100% of what you pay for will go towards supporting The Salvation Army's beneficiaries! 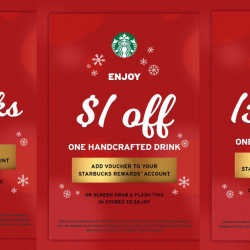 Till 16 Dec 2018 Starbucks: Flash Screen Grabs to Enjoy 3 for 2 Drinks, $1 OFF One Handcrafted Drink, $1 OFF One Food Item & 15% OFF One Merchandise Item! Oh the joy! Festive cheer! Your Merry Surprise is here! 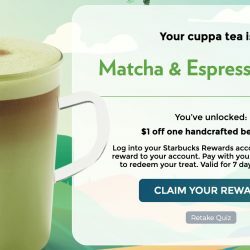 Play the game here to enjoy rewards: bit.ly/starbucksmerrysurprise! Or just flash the below screen grabs that we have grabbed for you to enjoy 3 for 2 Drinks, $1 OFF One Handcrafted Drink, $1 OFF One Food Item & 15% OFF 1 Merchandise Item! Valid till 16 Dec 2018. 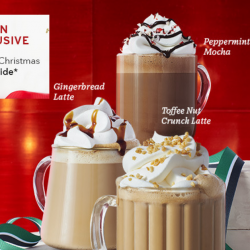 Oh holiday joy, indulge in rich, triple chocolatey goodness with the new Triple Chocolate Frappuccino® blended beverage or savor the popular Green Tea Java Chip Frappuccino® blended beverage at Starbucks. Both drinks come topped with fluffy whipped cream, red and green candy bits and a festive chocolate topper. Let the merrymaking begin! Available from 3 Dec 2018. 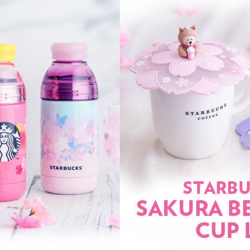 Check out the Starbucks x Precious Moments® collection too! 27 - 29 Nov 2018 Starbucks: Enjoy 1-for-1 Venti-sized Handcrafted Beverage from 3pm to 7pm! Some moments are made for sharing. From 27-29 Nov, 3-7pm, treat yourself to any Venti-sized handcrafted beverage and enjoy another FREE at Starbucks. T&Cs apply. 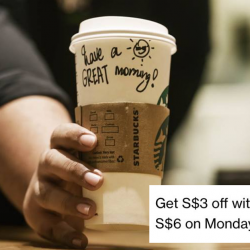 Till 25 Nov 2018 Starbucks: Flash Screen Grabs to Get 15% OFF One Merchandise Item, $1 OFF Your Favourite Drink, 3 for 2 Drinks & More! 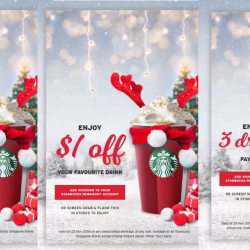 It's the holiday season, flash the below screen grabs to get 15% off one merchandise item, $1 off your favourite food item, $1 off your favourite drink and 3 for 2 drinks at Starbucks! Valid till 25 December 2018. 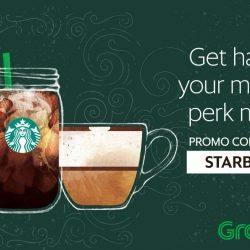 Starbucks: Peppermint Mocha, Gingerbread Latte & Toffee Nut Crunch Latte Available from 8 Nov + 15% OFF for Starbucks Gold & Green Members! Merry sips are here. Indulge in Starbucks' returning favourites - Toffee Nut Crunch Latte, Peppermint Mocha and Gingerbread Latte this holiday season. Available hot, iced and blended from 8 Nov. Plus Gold & Green Starbucks members get to enjoy 15% off storewide on 8 and 9 Nov! 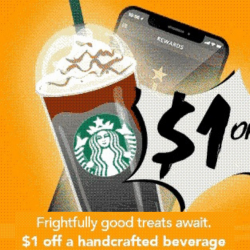 30 Oct - 1 Nov 2018 Starbucks: Flash Screen Grab to Enjoy 1-for-1 Venti-sized Handcrafted Beverage! A 1-for-1 treat for the brave. 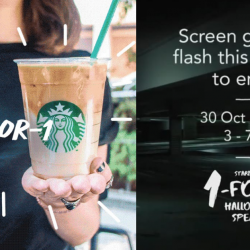 Flash the below screen grab and enjoy 1-for-1 Venti-sized handcrafted beverage from 30 October - 1 November 2018, 3 - 7pm at Starbucks! 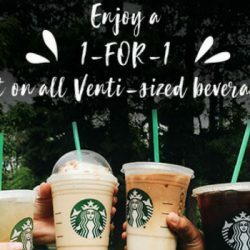 1 - 7 Oct 2018 Starbucks: Redeem $1 OFF a Handcrafted Beverage via Starbucks Mobile App! 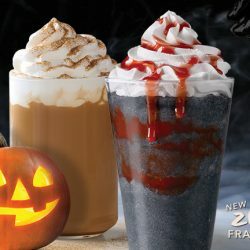 Frightfully good treats await. No trick, we promise! Pay with the Starbucks Card via the mobile app now to redeem $1 off a handcrafted beverage! T&Cs apply. Limited time only! Starbucks: Try the NEW Coffee & Milk Tea Panna Cotta Frappuccino® & Green Tea Panna Cotta Cream Frappuccino® Today! New drinks to try at Starbucks today! 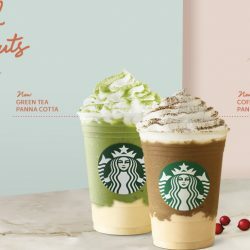 Available from 25 Sep for a limited time only, try the new Coffee & Milk Tea Panna Cotta Frappuccino® or Green Tea Panna Cotta Cream Frappuccino® at all Starbucks Singapore stores! 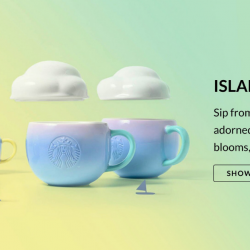 If you miss Starbucks' Anniversary Collection (little stocks left! Grab them while you can! ), check out another new collection - Enchanted Night! 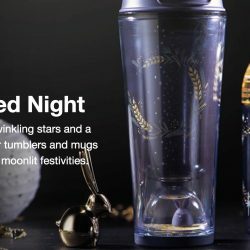 This collection celebrates the upcoming Mid-Autumn Festival with leaping bunnies, twinkling stars and a glowing moon. Their tumblers and mugs are all ready for the moonlit festivities! Now available at all Starbucks Singapore stores (unless otherwise stated) while stocks last. 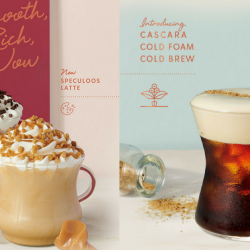 From 5 Sep 2018 Starbucks: NEW The Anniversary Collection – Updated with Prices! 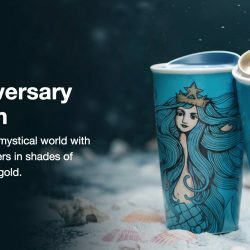 Dive into the Siren’s mystical world with Starbuck's The Anniversary Collection mugs and tumblers in shades of blue and touches of gold. Collect your favourites before they are gone! Enjoy the silky swirls of dark and white chocolate in Duo Cocoa Mocha or indulge in Speculoos Latte where caramelly sweet goodness and fragrant warm spice dances with the bold Espresso. Sweetened cold foam is flavored with Cascara syrup (for subtle notes of dark brown sugar and luscious maple) atop of bold, smooth Starbucks Cold Brew. 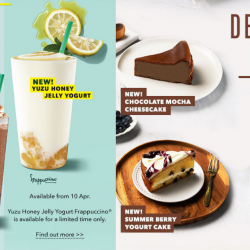 Try these 3 new Starbucks drinks starting from 3 Sep for a limited time only! 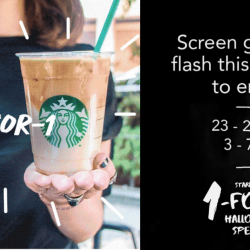 27 - 31 Aug 2018 Starbucks: Flash Screen Grab to Enjoy 1-for-1 Venti-sized Drink from 3pm to 5pm! Enjoy a 1-for-1 Venti treat from 27-31 Aug, 3-5pm at Starbucks! Just flash the screen grab below in stores to unlock your treat. Valid on all Venti-sized handcrafted beverages. T&Cs apply. 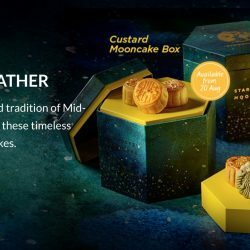 Celebrate the age-old tradition of Mid-Autumn festival with these timeless Starbucks® Mooncakes. Starbucks Rewards™ members, treat your friends and family to these Starbucks® mooncakes and enjoy 15% off when you purchase 2 boxes or more. 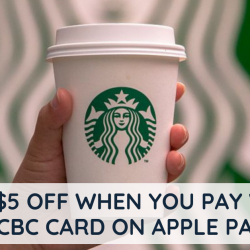 Valid when you pay using your Starbucks Card.